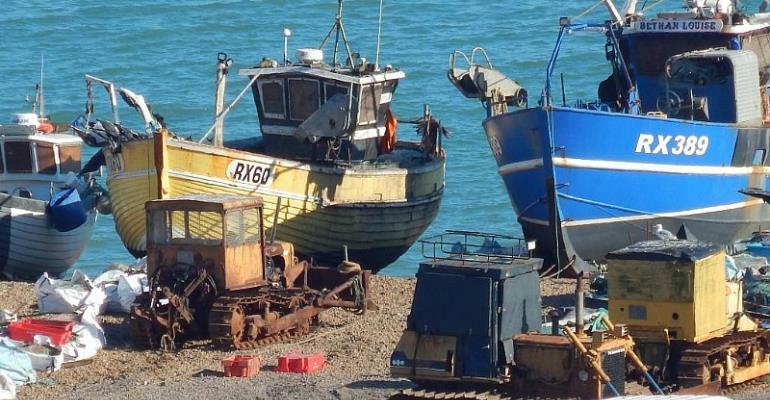 Despite reassurances by French French Minister of Agriculture Didier Guillaume that it was "not possible" for Britain to close its waters to French and other EU fishermen after Brexit, fishers in Boulogne-sur-mer, France's largest Channel port, told RFI they're worried for their future. Currently more than half of their time is spent fishing in British waters. "We do not accept that... that is not what we want," Guillaume told a meeting of fisheries professionals in the Channel port of Boulogne exactly a week ago on 22 March. "Nobody would understand why, because of Brexit, the British would close off their territorial waters," promising that "not one fisherman [would be left] in difficulty because of Brexit". But some fishers in Boulogne-sur-Mer are beginning to fear the worst. Boats from the Pas de Calais, Normandy and Brittany take more than half their catch in British territorial waters and for Jean-Charles Framery, owner of Frégate 3, it's even more. "We spend 70 percent of our time in English waters," he told RFI. "If they reintroduce their border, we'll be forced back into ours. Will there be any fish there? We don't know. It's wait and see but we're worried." Under an EU-wide plan, France is considering how to compensate its fishers if they have to remain in the docks. But for Stéphane Fournier, owner of La Trinité, this is neither a long-term nor desirable solution. "I have a trade, I want to work, even if there's compensation for remaining in the port, a boat that stays in the docks is a dead boat." Looking for other waters to fish in is not an ideal solution either. "Going elsewhere means going further afield, paying for more diesel. And if we all find ourselves in French waters, it's not going to work." Bruno Margollé, vice president of the French fishing committee is also concerned about the concentration of fishing vessels in French waters, warning it could turn the seas into a battle field. "500 boats are going to be coming into the French zone, it'll be an explosive cocktail," he says. "The slightest skirmish and it'll turn into a battle." Margollé, co-owner of the Nicolas Jerémy, just doesn't see a solution to the Brexit headache. "We don't have a plan B, I can't tell my men tomorrow 'you're sacked'. It's out of the question. We've invested in transforming our business, we have a million euros in outstanding loans, what do I do?" Fishmongers are worried too. Aymeric Chrzan, secretary general of the fishmongers union in Boulogne-sur-Mer, estimates that 30% of their business would be affected. "If on the one hand our fishing fleets can't bring back as much produce as usual, and on the other we're limited in terms of fish imports from the UK, it will have serious consequences on jobs and threaten the very existence of our companies," he says. If there's a no-deal Brexit, the UK will default to World Trade Organisation rules, there'll be different customs arrangements. Controls are already being prepared at the port of Boulogne to cater for the 200,000 tonnes of fish the UK exports through France. Under EU rules, fresh food from Britain, including fish, will be classified as being from a “third country”, and checked for disease, traceability, rules of origin and welfare mandatory on the French side. For Marc Salmon, head of Whitelink seafood in France, that means more red tape. "We have a very tight logistics timetable," he told RFI. "If tomorrow we have to carry out food safety checks, that'll take a certain amount of time. Does that mean we'll have to keep this merchandise an extra day because we've got no time to send it out?" Despite it all, Salmon remains convinced fishmongers will adapt. Meanwhile French Agriculture Minister Didier Guillaume insists: "we are confident" and "we are combative because we are resolutely out to defend French fishing and French fishermen". Fishers in Boulogne-sur-Mer want to believe he's right.